No one automatically knows how to nourish, repair and manage their brain, but it needs those things all the same. The physical things we do such as proper nourishment, avoiding alcohol and tobacco or other toxic things, are a given. But what else can you do to enhance and control your brain to make your life more productive, give it a purpose, creative newer more positive thoughts and all-round happiness? Dr. Lawrence Katz, a pioneer in neuron regeneration research, shares that each one of us has 60,000 thoughts per day. To put a fine point on it that’s one thought per second. Unfortunately, the brain tends to repeat 95 percent of those thoughts and in review, about 80 percent are negative. It seems the hardwired brain wants to pay more attention to negativity than positive clarity. MRI imaging of this negative region show that these bad thoughts stimulate the areas of the brain that deal with anxiety and depression. But the hardwired part, that’s pretty much a fallacy. An ordinary person hooked up to a biofeedback machine can quickly learn to control bodily mechanisms that typically operate on automatic pilot. For example, you can learn to lower your heart rate or your blood pressure. It’s true. 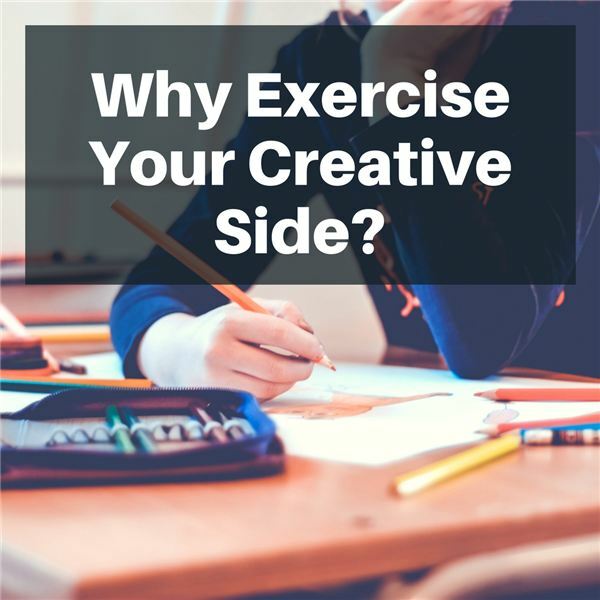 You can also get into a state of alpha-wave brain patterns with meditation and artistic creativity to reduce depressive symptoms and increase creative thinking. Creating art also provides a distraction, giving your brain a break from your usual thoughts. The optimum state achieved with creating art is called, “flow." While you may have not heard about 1700s Swiss philosopher Jean-Jacques Rousseau, he believed that the brain was continually organized according to our experiences and that people should practice mental exercise as well as the physical type. Evidence for this came out in the twentieth century when American psychologist Karl Lashley trained rats in a maze to seek out food rewards; and they were able to comply even when he removed large portions of their cerebral cortex bit by bit. Not nice but, amazingly, the rats were still able to navigate with 90 percent of their cortex removed! Their brains used the sense of smell and feeling in conjunction with their previous knowledge and created new axons and formed new synapses in the brain to take advantage of their other senses—so they could wend their way through the same maze. So, in essence, the brain’s circuitry makes living tissue that can reshape thoughts, experiences and memories (and the desire to find food). The more you ask your brain to do, the more it can do. Your brain is capable of making a quadrillion synapse (suffice it to say that is one million billion). Synapse are the way the neurons in your brain connect to send messages; the neural network in your brain is your own computer at work and it is capable of much complexity. There are people who have total recall. They have a mysterious condition called hyperthymesia. They remember everything with total recall. Their mental games involve talking about random dates in the past such as their “finest birthday" and they can relate the day of the week, what everyone wore and what was eaten. They are like the Google of their own lives. There are some traits that can ease your brain into new territory. It is well known that Einstein was a super brain who faced the unknown and conquered difficult concepts in physics. But his main strength was in being adaptable. If something didn’t come to him, he was willing to hang loose and sleep on it, often dreaming himself into a spiritual state of surrender, taking on new motivation in the process, and recreating the awe of the mysteries of nature. When we imagine a beautiful sunset, we don’t have to gaze at one to experience some of the same feelings. Our brains take the bits of raw data and reach down to the cellular level to integrate our body, mind and the outside world to paint a picture in our minds. Your brain’s ability to grow connections and change throughout your lifetime is called brain plasticity, or neuroplasticity. In plain English, this means that your brain can change, forming new brain cells and neural connections and improving its capabilities throughout your life. What are some things we can do creatively to exercise our brain and achieve a state of mind that is most beneficial? Let’s start with art. Art relieves stress by helping you get into a state of flow. A distraction and focus away from your usual thoughts. Art also elevates self-esteem by letting you accomplish something you can see visually. What you will need to think about to begin, is to allow yourself to be crappy. Yes, do the deed and face the terrible. Because art is not the venue of the serious few. Look at other art for exemplars. Copy what you love. Painters of history often worked in shops where all they did was copy the “masters" until they eventually developed their own style. If this seems overwhelming to you, just color. Find one of the calendars or coloring books made for grownups today and draw. That simple act will put you into a state of flow and make it a place you might want to visit more often; and let it take you into other pursuits. Be open to new experience. Study what you hope to achieve by finding examples and then study the people who achieved it, and then study the people who they studied. Reading increases the white matter in the brain and that carries information between the regions of gray. You don’t have to know exactly what that means to know that the diligence, patience, and determination of reading generally, helps you grow intellectually. If you can add learning a foreign language into that equation, you will be hitting areas of the brain responsible for spatial navigation and overall memory. And if you can read in another language, so much the better. Studies show that loneliness can shave eight years off your life expectancy. That may not move you but conquering social isolation is one of the tools of lifestyle changes that can keep you feeling better, more confident about yourself, and help to stave off illness. Having a sense of purpose may seem like an esoteric option, but people who have a goal, a desire, or a purpose more-than-making-money also get better sleep and go to the doctor less. Plus, optimism about your age no matter where that may be, with an upbeat view, means you are more likely to recover from a severe disability and seek out better preventive health services. If you can, be publicly minded. Thucydides, an Athenian historian and general whose History of the Peloponnesian War recounts the fifth-century BC war between Sparta and Athens had no use for men who refused to participate in public affairs—at that time they called people like that “Idiotes" (ΙΔΙΩΤΕΣ). Thucydides wrote: “The man who took no interest in the affairs of state was not a man who minded his own business, but a man who had no business being in Athens at all." Chopra, Deepak M.D. and Rudolph E. Tanzi Ph.D. Super Brain: Unleashing the Explosive Power of Your Mind to Maximize Health, Happiness and Spiritual Well-being. New York: Random House, Inc., 2012. Book.